Round the corner from vibrant, messy, noisy and exciting Brick Lane, into these scrub bedded, patch lawned and bottletop strewn 4 acres. Every available surface, 2D and 3D, is graffitied. On the park sign, someone’s carefully scraped away a section of paint from the second ‘L’ of ‘Allen Gardens’. Changing it to ‘Alien Gardens’. I stroll the tree lined perimeter of the park, around the large square of grass. A few people lounging, children playing on the zip wire. A line of poplars partly screens off the railway. Around their bases, long grasses and wildflowers grow. Some of the trees have boots and shoes dangling by their laces like strange fruit. In medieval times and up until the 18th Century, much of the area where this piece of ground lies was fields and open common land called Hare Marsh where wild flowers and herbs were abundant. Folk from the smoky, stinky city could walk and picnic and breathe fresh air, play sports and trap hares to be slung in a sack, lugged home and hung for jugging (today, one tiny dead end street, just to the north on the other side of the railway tracks, still bears the name Hare Marsh, but there’s nothing marshy about it. And not a hare in sight!). Allen Gardens lies just below where London overground railway crosses above the eastern main line (originally the Eastern Counties Railway, which was cut through here in the 1840s, severing the community in the process). We’re at the northeast corner of Spitalfields, just below the southern edge of Bethnal Green and bordered by Shoreditch, originally hamlets and villages which speckled the rural landscape (they were some of the settlements that were part of the “Tower Hamlets” from the 16th century, which contributed to the Tower of London militia). From the 17th century, waves of immigration surged into the area, attracted by cheap housing and work in the growing industries such as brick making and brewing in and around Brick Lane. French Huguenot refugees fleeing religious persecution were welcomed to England. Many came here and set up their weaving workshops- the origin of this area’s most prominent and longest lasting industry: textiles and clothing. Over the next century or so with such a surge in the population, this land was transformed by suburban development. By the start of the 1800s new streets had been driven across the fields and meadows as part of Mile End New Town. 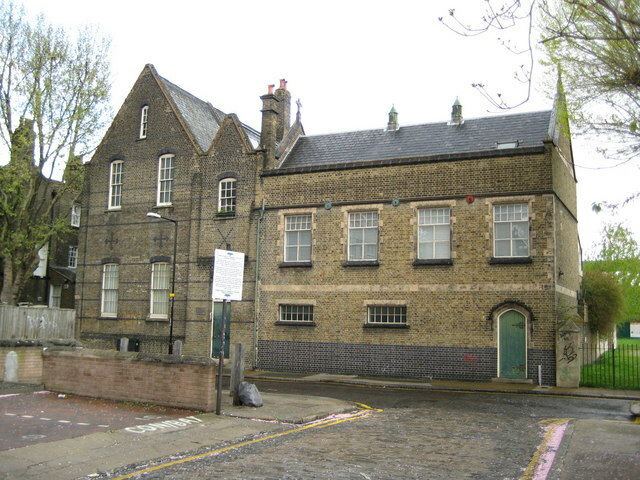 The parish workhouse was built on this spot, its occupants labouring in the yards and gardens. I walk across to the eastern flank of the park. A school field sized flatness of grass, inviting a sprint, a long jump. Or cartwheels. Two girls in sports gear are exercising, skipping and doing handstands. Further over, a pair of yapping dogs are chasing each other in circles as their owners chat, both brandishing plastic ball throwers as though they are weapons. In front of the northern path is a patch of wild meadow. Long grasses have been swished and wind swirled by yesterday’s heavy showers. Knapweed, field scabious and yarrow are stabs of brightness and colour. I set up to draw towards the walls on the south side, solidly decorated with graffiti murals which act together to create a powerful multi- coloured statement (drawing at top). The buildings behind these graffitied walls are all that’s left of educational and ecclesiastical establishments here, dating back to the early 19th century. A school for poor children of the area was opened in 1811, sponsored by chemist and philanthropist, William Allen. Allen was a prominent anti- slavery campaigner and had also been a leading member of the ‘Spitalfields Soup Society’ formed to provide relief to unemployed weavers. The Church of All Saints was built where this large lawn is now, on the site of the old workhouse. It was left derelict after wartime bomb damage and was eventually demolished in the 1960s. The vicarage still stands, a tall chimneyed, gothic red brick building surrounded by exotic gardens, shrubs, palms and climbers which you can see bursting through the barbed wire topping of the wall. The next door buildings, now apartments, were part of St. Patrick’s Roman Catholic school, originally set up in early Victorian times to serve the children of Irish immigrants who escaped the potato famine and settled in this neighbourhood. The park was laid out by London County Council in the 50s and 60s on land made available when post-war temporary housing was demolished. It was expanded after the demolition of All Saints Church and slums bordering the railway and was named in honour of William Allen. My final brush marks are accompanied by rooster calls and donkey brays from Spitalfields City Farm to my left. Behind me the hum and rattle of trains clattering between the great iron triangles of the overground truss bridge. I pack my things and walk through the underpass beneath the bridge, which is like a portal to another universe, to a triangle of wasteland between the railway lines, a kind of no- mans land. But now everyone’s since its transformation into Nomadic Community Gardens. Bright graffiti iconography, giant indecipherable orange and violet text and a cheshire cat smile in multi blues draw me through the entrance into this space. A huge red clenched fist thrusts out of a buddleia bush. Everywhere is colour and imagery. Even the air is painted with impromptu music. Clapping, singing, a guitar. Nomadic Community Gardens was set up by James Wheale and Junior Mtonga in 2015 as a not for profit organisation, dedicated to transforming disused spaces into urban gardens where people can grow their own produce, create art, share skills, and discover what it means to build their own community from the bottom up. The lease of these two and a half acres was negotiated at a peppercorn rent on a ‘meanwhile’ basis, until the the landowners have decided what they’re going to do with it. I hope they’ll take their time (I remember my visit to Meanwhile Gardens in North Kensington on a hot day in June 2016, see Sticks in the Smoke 18. That was founded in the mid 1970s and still going strong!). The organisation is funded by money raised from events and donations. The site is maintained by volunteers. No mains power or water supply, so drinking water has to be brought in, rain collected in barrels for watering and electricity is generated from solar panels. I buy a coffee from the Roving Cafe, a little 3 wheeler Citroen truck, converted into kitchen and bursting with vegan- friendly foodie delights. Hayley, the owner has been based here since the gardens’ inception. She tells me about ‘Meeting of Styles’: London’s largest street art festival which happens in the gardens (1 and 2 July). Graffiti artists from far and wide gravitating here for a painting bonanza! I take my mug of coffee with me to explore and hunt for somewhere to make a drawing to somehow sum up this extraordinary visual feast. There’s so much activity. People fixing shelters, tending plants, hauling buckets of compost, chatting, laughing, shouting. And preparing hoardings and walls for the graffiti festival by blacking or blueing over all the previous imagery. Everything is wonderfully ramshackle and makeshift. Woodchip paths snake haphazardly between sheds, greenhouses, cafes and meeting spaces built from old doors, pallets, building timber and reclaimed window frames. Sculptures made from junk, old cars and shop dummies. A playground with an old boat, overlooked by a huge, leaning giraffe- like creature. Everything is built to be temporary and easily movable, so all plants are in pots, containers, baths and tyres. Decorated plank- built planting boxes are bursting with herbs, vegetables and fruit trees. This is like a cross between a shanty town, a music festival and allotments. I start my drawing, looking through assorted structures and plants towards the large wall which dominates the space. A multi faceted painting includes a bus being torn apart by a giant octopus. To my left are some beehives and beyond is a glimpse of the gold domed Perle Opera House (with it’s combustive roof declaration of: “timing” “temperature” “turbulance”), a focus for the space, where music festivals, performances and community activities take place. I smell a waft of smoke, curling fragrant from the wide campfire pit in front of it. Everyone who walks past stops to talk and look at my drawing, or at least says hello or smiles. I feel so welcomed. A woman with big sparkly earrings and a rattle of necklaces comes by and proclaims exuberantly in a french accent: “I LOVE artists! Marry me!”, gives me a hug then swoops her bags of veg away before I get a chance to reply! One guy keeps coming over to look at my drawing and gives me thumbs ups from further away. When he comes back I ask him if he has a plot here “Yeah, I do” he says, “Well, it’s me Mum’s really. She looks after it”. I did start drawing the large wall with its painted bus and octopus, but halfway through, it had been blacked out too! Frustrated, I turned round and drew a different background instead (see drawing above). Created by and for the community, a complete mix of ages and cultures and ethnicities tending their little patches or meeting friends. Perfect green neighbourliness and cooperation. Even if you come simply as a visitor or observer and stay only a little while, it’s easy to feel part of what’s happening here as though you have a deeper involvement. In all the green spaces I’ve visited over these past 18 months, for all their perfect trimmed box hedges and rose beds. For all their fountains and scrolled ironwork. For all their noble statues and grand vistas, I’ve never felt so much like I belong than I do here.